I went to the sauna tonight for the final time before the MDS starts. 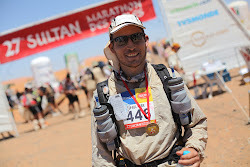 In total I have done 9 sauna sessions in a row, and those combined with my desert runs in the midday heat, as well as the Bikram yoga lessons I did in the weeks before I came to Morocco should stand me in good stead to cope with the heat I will encounter during the race. I stayed in the sauna for 40 minutes, but once again the staff had forgotten I was coming, so I got in the sauna while it was still heating up. When I first got in, it was below 60C (140F), but by the time I left it was a respectable 82C (179.6F). The rest of the evening I have trying to shave some precious grams off my pack weight. I managed to cut some buckles off my rucksack that seemed surplus to requirements, and I decided to take 1 spare shoelace instead of 2 (what are the chances of 2 breaking). I also managed to put my windproof jacket and windproof trousers in a single stuff sac, so I saved a few grams there. Really when I looked at everything laid out on the bed, apart from the food I must only have a couple of kilos worth of stuff. There is only one thing that bothers me and where I feel I did not make a good choice. The tube of suncream I am carrying is huge. It is 180ml and that is way too big a tube for 6 racing days when almost my entire body is covered with clothes (other than my face, hands and a small section of my legs). My suspicion was confirmed when I saw a report from the previous year's highest placed Brit that 100ml of suncream is ample. Now I could squeeze out some suncream before the race starts, but I will still be left with the honking great tube taking up needless space. If you think I am being a little over the top you should have seen my kit laid out on the bed. It was basically food, medical and survival kit, sleeping bag, windproof clothes, sand goggles, fleece, and then the great honking tube of suncream. I guess I will just have to squeeze some excess out and then put up with it, unless I can make a pact with another competitor that I share my sunscream with them in return for them carrying a small item of mine. My final comment on how the day went is related to some frantic email exchanges that were going on throughout the day. Some of the Mencap participants wanted a confirmation of how many calories they needed to present at the checks, and then another team member told them they only needed food for 6 days. Actually the rules make it clear that you need 2,000 calories per day for 7 days i.e. 14,000 calories must be presented at the checks. The confusion was soon cleared up and everyone except maybe the person who thinks you need food for 6 days is happy. The rest of the exchanges were related to packing and what should go in the hand luggage and what should go in the hold, incase the hold luggage gets lost. I was not so interested in that discussion though, because I am already here in Morocco with all my stuff.